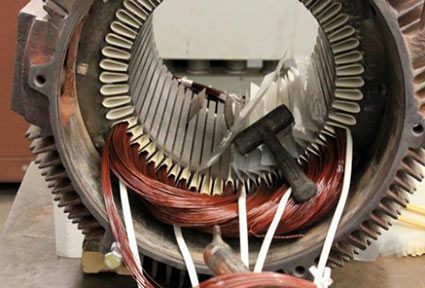 At HECO, we don't believe in off-the-shelf solutions to electric motor rewinding & repair. That kind of approach might fix a problem now, but won't prevent it from happening again. And you have better things to do than to chase the same repair problem time and again. So before we start any repair, we ask "Why." Why did the failure occur? What can be done to keep it from occurring again? Only then will we begin the repair. And our capabilities there are second to none. 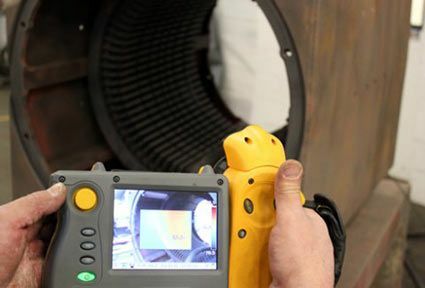 HECO performs a detailed inspection of the "as found" winding condition regarding dimensions, bracing, and coil insulation details for exact duplication or improvement. HECO details the lead labeling/configuration for duplication. 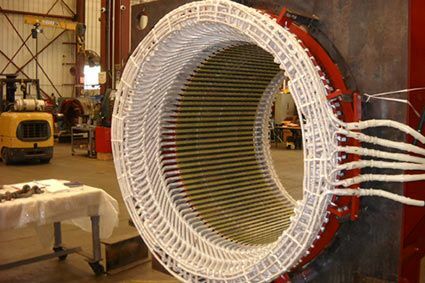 The winding is carefully stripped using temperature-controlled ovens (with water suppression) to obtain detailed winding data. 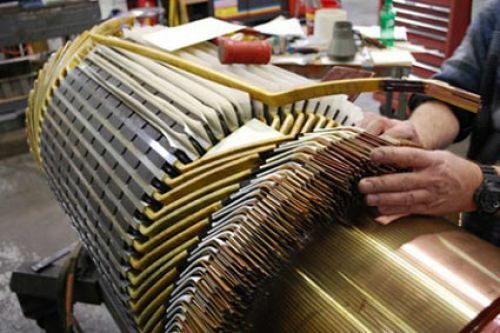 Collected data is documented on detailed winding data forms and through accompanying digital images. The original winding data is then confirmed using engineering computer programs to calculate winding design parameters and to verify the winding is correct as is. In some cases, an improved design is proposed. The original insulation system is evaluated, and a new insulation system is developed for improved dielectric integrity and heat transfer. ("Class H" insulation materials and inverter-duty wire insulation are standards.) 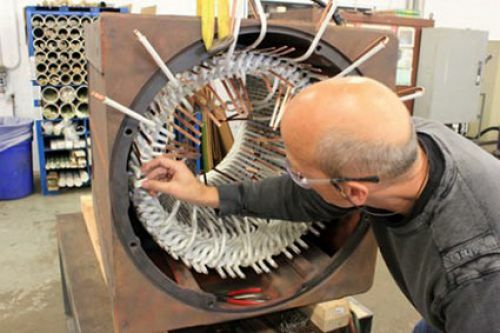 Design details such as volts/turn are evaluated with every rewind for improved turn-to-turn insulation protection. The coil design is then CAD drawn for detailed dimensional fit to the slot. All insulation materials used are included in this detail to provide the correct slot fit of all form coils. Compatibility of all insulation materials is confirmed for a congruent and consistent system with improved longevity and insulation life. 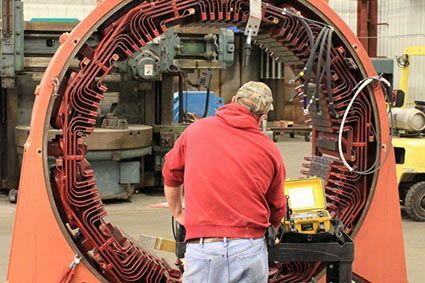 Detailed electrical tests are performed based on IEEE Standards to confirm winding integrity throughout the winding process. Vacuum Pressure Impregnation (VPI) with Solventless Epoxy Resin is used for sealing and bonding insulation materials. Extensive studies have shown epoxy resins (such as HECO's Von Roll Permafil® 74035) to have superior chemical resistance, sealing/bonding, and heat-transfer characteristics. Our all-in-one process VPI penetrates and coats the windings completely with 4 to 5 ml build. as the original units, which makes it worth considering the redesign option. 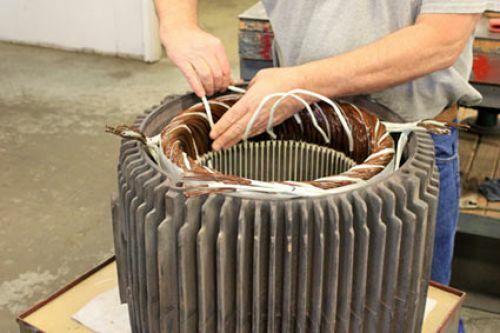 Our goal is to improve upon an original motor's design: We provide superior winding designs with better insulation materials and increased wire cross-sectional area, thereby delivering a well-engineered and much-improved final product.